Bio: Ron Monsma lives in Mishawaka, Indiana and is an Assistant Professor of Drawing and Painting at Indiana University South Bend. He has been painting and teaching for over 20 years. He paints only from life, (apart from the birds!) Ron has also worked as a successful illustrator, creating works for a number of clients including St. Mary’s College, Memorial Health Systems and Bank of America. In 2007 he created an original work for the Fischoff National Chamber Music Competition. 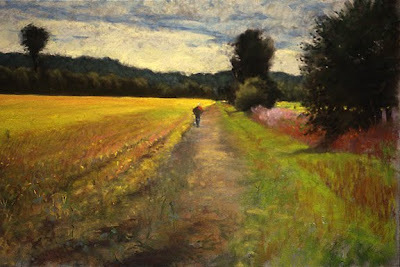 In 2008 Ron was awarded the Jack Richeson Best of Show Award in the 9th Annual Pastel 100 competition sponsored by the Pastel Journal. For more on Ron, his philosophy, his technique, refer to the Pastel Journal, April 2008, and also the feature article in the Pastel Journal, March/April 2001. 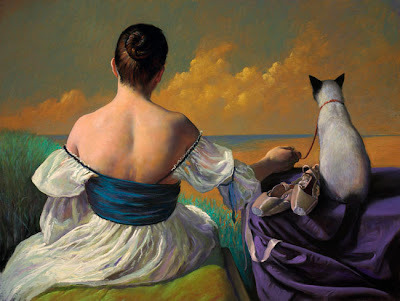 Subjects: Figurative, Still Life, Landscape. Style: Ron’s approach stems from the Dutch Baroque tradition and offers an exciting opportunity for those artists who want to increase the drama of light and shadow in their work. As stated by the artist in an article in International Artist magazine: “Whether I am painting a still life or figure (or landscape) light plays an important role. I work in the Baroque tradition where light reveals and distills form and all its nuances. This is stage lighting where illumination exposes a mood, a setting or situation or some event about which we are not quite certain. It is light that invites the viewer to make discoveries in the shadows.” Curiously, in terms of the figurative material, the artist that come to my mind when viewing Ron’s work is Caravaggio. The dramatic tension, expressed in the masterly use of chiaroscuro, is palpable. The classicism is married with a sort of modern mythical fantasia to culminate in a unique expression. 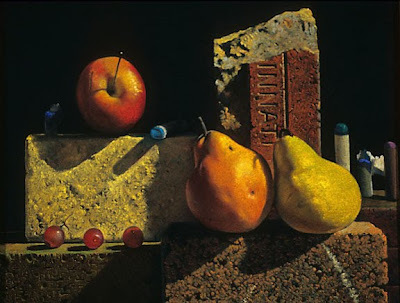 The classicism is not lost in the landscapes, nor in the still life arrangement, although the latter clearly belong in a modern tradition, as expressed by such individual artists as Daniel Green, Andrew Hemingway and Daniel Massad. Navigation: The main menu remains accessible to the side. Gallery: Figurative (11 paintings); Landscape (12 paintings); Still Life (two pages). Image View: Each thumbnail may have a tooltip attached with data on medium and size; this information also remains attached to the enlarged image. The enlargement will have the option to go forward or back to the next image in the sequence. This option is not obvious; it does not appear until you move the cursor to the middle of the right of left margin of the image. You may also close the image to return to the gallery page. Not all images have the data attached, and as Ron paints in oil as well as pastel, it is not clear which medium has been used in the unlabelled paintings. Because Ron’s subjects are so disparate, I could not choose a single image typique. So I have selected one from each aspect of his work. Refer your painting Dutch Baroque Tradition landscape in pastel and oil. How did you execute the painting using both these mediums. Was it oil pastels? Or? You will have to ask that question of Ron Monsma himself. You can contact him via his website.